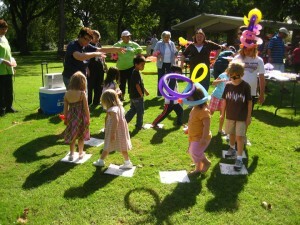 Here are photos of our 2011 Oktoberfest celebration at Heights Park. Contact us if you’d like a full-size high quality version of any of these, or want any photograph removed from our site. Thanks to everyone who came! Bounce House, face painter, bobbing for apples, horseshoes, free food! We’ll have a pumpkin decorating contest with prizes awarded for the SCARIEST, FUNNIEST, and MOST CREATIVE pumpkins! If you want to decorate a carved pumpkin, please carve it at home. We’ll have other decorating supplies on hand for you. The Epiphany and Heights Park N.A. Neighborhood Garden was expanded on Saturday, Sept 24th. There was a big turnout of people helping and now the garden is almost double the size! You may email Margaret at paulmiller4@att.net to reserve a plot. The plots are 20′ x5′ x 6″. Eatable food is to be grown in the plots. The plot cost for 1 year is $75. We ask that you donate 10% of your produce to be given to Network. This spring’s produce taken to Network has been 500 pounds. Come join the fun and meet neighbors and friends. Deadline for registering to have a police officer at your NNO block party was last week, but let us know if you plan to have a party. We’re hopeful that Heights Park will have a successful NNO this ar — as we’ve had in the past. Richardson is looking for a 1st Place repeat this year. Let’s have a great turnout for our neighborhood! Bounce House, face painter, games, free food! Plus some special activities! More information coming in the HPNA Newsletter in September. You won’t want to miss it this year! Watch for the HPNA Newsletter coming to your doorstep during the first part of October.